Amarnath Yatra is the most sacrosanct of every single holy place devoted to Lord Shiva, rousing the most looked for after of His journeys. That so a large number see the brilliance of the omniscient God in the fluctuating of a normally happening Shivlinga is no not exactly a genuine demonstration of the wonder of nature's consistently changing rhythms existing together with the unalterable, irrefutable nearness of God. In the event that Lord Shiva has genuinely called you to visit His heavenly holy place at Amarnath, be guaranteed that our Amarnath Tour bundles are the ideal solutions to your supplications for a very much made, fastidiously executed and profoundly synergist Amarnath yatra. 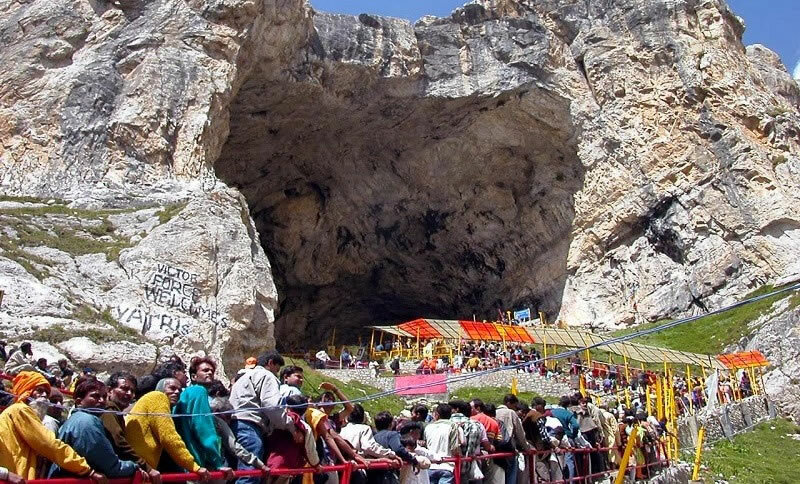 Regardless of whether you need to visit the heavenly cave of Amarnath from Baltal or Pahalgam, or additionally need to incorporate the wondrous spots of Kashmir alongside Maa's sacred place of worship at Vaishno Devi in a solitary voyage, our Cheapest Amarnath yatra packages are very much custom fitted to suit your one of a kind desires from the blessed journey. This year the holy Amarnath Yatra begins from1st July 2019 and will end on 15th Auguest 201. You can register for Amarnath Yatra 2019 and downalod Health Certificate and Registration From Our website, Additionally you acn also Book Helicopter Tickets from https://onlineholidays.in, Registerd Yatra Tour Operator In Kashmir For Best Amarnath Yatra Packages 2019 conatct Online Holidays. Arrival at airport ,meet and great by our representative, transfer sonmarg overnight at Sonmarg at Hotel / Camp. Snow Point Pony owners have a strong hold in Gulmarg and Pahalgam and restrict our vehicles travelling in these two villages. Guests have to listen to the instructions of the TMs and/or local guides in dealing with the local in the eveing return back to srinagar Enjoy dinner & overnight stay at the hotel. 1 Night in Deluxe Houseboat. 1 Night in Hotel Srinagar. What To Wear? Pilgrims are encouraged to convey adequate woolens, for example, sweaters, drawers, woolens pants, monkey top and so forth. Different things could incorporate breeze miscreants, downpour coat, portable bed or covers, umbrella, waterproof boots/shoes, strolling stick, burn and so forth. Women are prompted not to go on the trek in saris, rather Salwar suits ought to be utilized. Medical Assistance? Medical posts kept an eye on by qualified specialists and nursing staff are built up enroute to take into account the requirements of the explorers, free of expense. Notwithstanding, pioneers are encouraged to convey along any meds explicitly endorsed for them. Where to eat? Essential apportions are accessible at reasonable value rates from the extraordinarily settled Govt. Warehouses at Chandanwari, Sheshnag and Panchtami, Numerous wayside coffee bars and little eateries are set up by private gatherings. Nonetheless, travelers are encouraged to convey with them scones, tinned nourishment and so on to take into account their prompt needs. Kindling or gas can be gotten at Chandanwari, Sheshnag , Panchtarni and close to the Cave. Is it safe to go? In perspective on the perilous nature, explorers are encouraged to safeguard themselves before continuing on the Yatra. As of late SASB has been giving Accident Insurance spread to the Registered Yatris (Pilgrims). Where to hire? Good risen settlement with united offices are set-up amid the Yatra time frame. These are given based on installment of rates fixed by the specialists keeping an eye on the Yatra. How to register? Registration of explorers are attempted ordinarily a month in front of the date fixed for initiation of Yatra. The dates are informed through press notices. According to rules no Yatri is permitted to continue on the adventure without a Registration Card/Permit. The procedure of Registration for Yatris (Pilgrims) of Shri Amarnathji Yatra 2019 will initiate as indicated by the dates set by the Shrine Board, at the same time for both the Baltal and Chandanwari courses, through assigned Bank Branches everywhere throughout the nation. Do's And Don'ts for the Yatris: It is imperative to watch discipline on the trek and continue moving gradually and consistently. Hold fast to the directions issued by the Yatra Officer occasionally. Authorities of the State Government from different concerned Departments are conveyed on obligation to support the pioneers. You should likewise guarantee that you are physically fit for the adventure, and have yourself therapeutically inspected. Keep in mind that you need to cross Mahagunus pass which is at a height of 14,000 feet above ocean level. It is currently basic for the candidate Yatri to submit Compulsory Health Certificate while looking for enrollment during the current year's Shri Amarnathji Yatra. You may sympathetically guarantee that horses conveying your gear and eatables stay with you consistently. Additionally guarantee that the Ponywalla, worker or Dandiwalla is appropriately enlisted and conveys a token. You can get these assigned at fixed rates at the base camps..